The Dobcross Youth Band is a brass band of committed players aged between 9 and 18 years old from the Pennine village of Dobcross in Saddleworth in the north of England. Formed in 1988 with a few village children it has now grown into a thriving organisation playing 30 to 40 engagements each year comprising of fundraising, contesting, social outings and supporting charities. 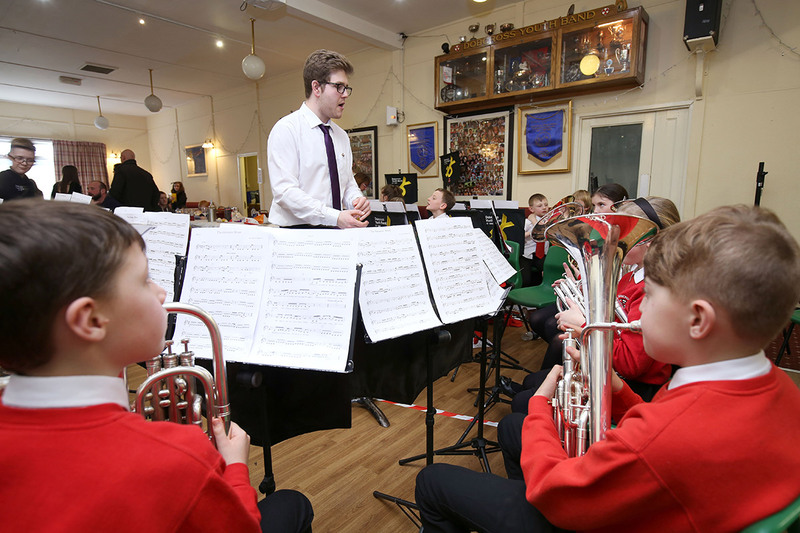 The band aims to provide an environment where children and young people, irrespective of ability or background, can learn to play a brass instrument, improve their musical skills, perform successfully as a band and develop an understanding of discipline, self respect and teamwork. We have lost count of the number of players who started with the band and then moved on to other higher graded bands. 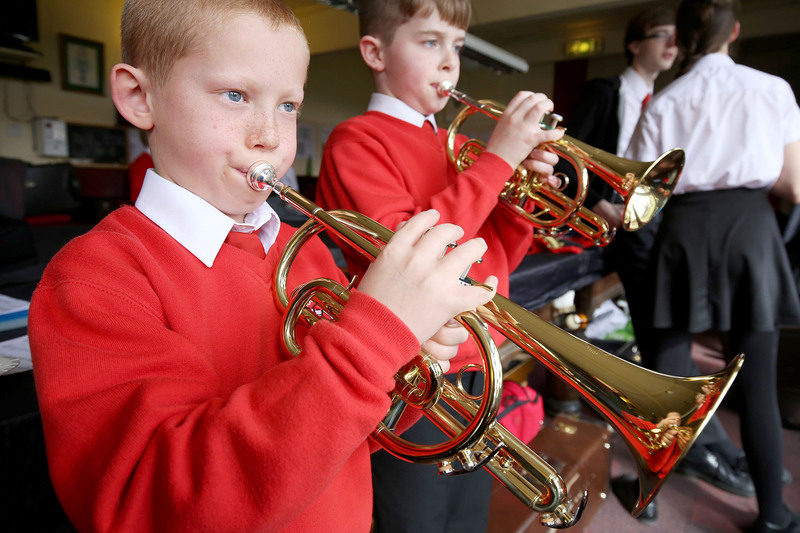 Many championship band players started their life with the Dobcross Youth Band. Matt is a top class brass player as well as a teacher. His career in music has seen him play under the baton of Ian Porthouse at Pennine Brass and then join the ranks of Foden’s Championship Band. He has also guested with some of the top brass bands, including Brighouse and Rastrick, Grimethorpe and Black Dyke. He is a founder member of the Jager Maestros Oompah Band, where he plays alongside our former Musical Director James Garlick. Matt attended Wardle High School and was a member of the successful Rochdale Borough Youth Band where he developed his talents as a bass player under the guidance of Eric Landon. He graduated from the Royal Northern College of Music and then qualified as a teacher at Manchester Metropolitan University, going on to become Head of Music at Tottington High School in Bury. As well as continuing the Youth Band’s traditional calendar of events – including the Regional Brass Band Championships in Blackpool and the Whit Friday contests – Matt has arranged collaborations with adult bands, including a Massed Brass concert in Uppermill alongside other Saddleworth bands, master classes with principals from Black Dyke, Foden’s, Grimethorpe Colliery, and Brighouse and Rastrick Bands and a join concert with the world famous Fairey Band. Acclaimed euphonium player Seth Livingstone is the musical director for our trainers and beginners’ sections. Dobcross born and bred, he started his own musical career with the band at the age of seven, started helping out our younger players as a teenager and officially finished his playing days with us as solo euphonium in 2014 – although he has also regularly guested with us since then. He gained a first class honours degree from the Royal Northern College of Music in 2018 and is now training as a teacher. He currently plays solo euphonium with championship section band Rainford and while at RNCM was a member of the multiple award-winning Brass Compass quartet. Seth has assistance from senior members of the Youth Band for the beginners’ sessions, so they can be taught in small groups of two to four players. This individual attention – and practice at home, of course – helps them to make progress quickly so they can join the thriving training band, where they learn to play as an ensemble. Seth’s philosophy is that our young musicians should enjoy every single rehearsal and he encourages the training band to choose the music they play, to support each other and to have fun while improving their skills.